The Hasselbachers of Nuremberg are my immediate Hasselbacher family. My Great-Grandfather Johann left Diespeck for Nürnberg around 1890 after his tour of duty in the Calvery. 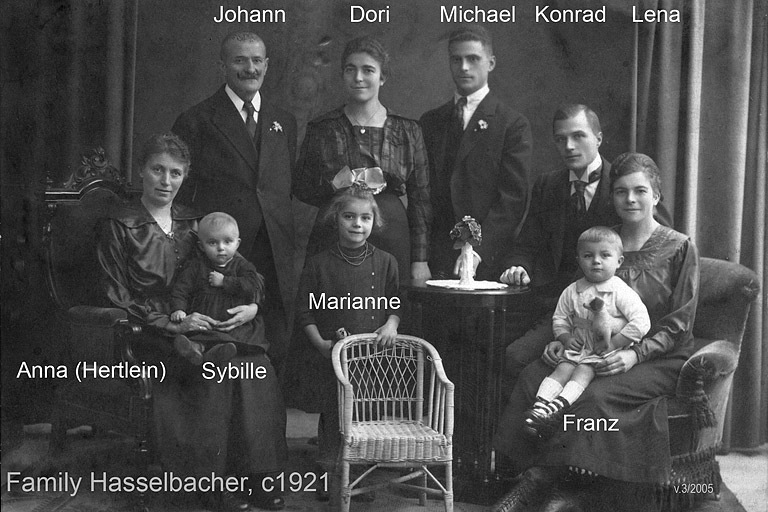 His two sons, Konrad and Michael married two sisters, Karolina and Dorothea Bayerl. Johann and Anna had a daughter Babetta who immigrated to the USA in 1912. (I think the empty chair is for her.) The two daughters of Michael and Dori each had a son who is still living in Germany. My father, Franz, was born in Nürnberg and immigrated to Bloomfield, New Jersey in 1925.